It doesn’t take a coffee connoisseur to figure out that cold brew coffee is a step above traditional methods when it comes to making a good brew. The main benefit of preparing coffee this way is that it not only delivers a great taste but also reduces the coffee’s levels of acidity. This is because the coffee beans are not affected by any heat, thus they do not develop any bitter or acidic taste to speak of. In principle, a cold brewed coffee will prove much smoother than traditionally brewed coffee ever could. Not only that but you will find coffee prepared this way to be a lot easier to store in the refrigerator. You see, once you heat up coffee, it exhausts its preservative properties to quite a degree, which is why it then loses most of its flavor when you cool it down past a specific point. With cold brews, however, you can conserve the flavor of a batch of coffee for as long as you want. Having said that, let us point out that there are specially designed coffee makers to help you prepare coffee this way and they’re enjoying quite an increase in popularity these days. As a matter of fact, cold brew coffee makers are almost twice as popular today as they were just ten or fifteen years ago. This is precisely the reason why you might not get the quality you desire if you go looking without having a grasp on what makes a good cold brew coffee maker to begin with. 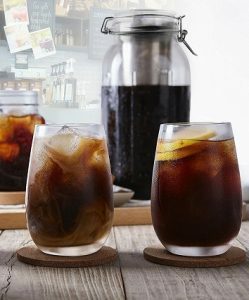 To help you in that regard, we put together a list of the ten best cold brew coffee makers the market has to offer at this point in time. Besides the primary purpose, this is a cold-brew coffeemaker that adds a certain degree of elegance to your kitchen thanks to its stylish wood frame. In terms of its functionality, it makes acid-free coffee yet not compromised in flavor to any degree. At the same time, it comes with an effective, permanent quality ceramic filter for extra brewing convenience and coffee quality. We should also point out that it is designed for ease of use, as all you need is to put water atop your coffee grounds into the brewer and you are good to go. With the Filtron’s Coffee Brewer, you can make cold or even hot coffee or other beverage in its 35-oz decanter. Its flask features a sturdy plastic build that integrates functional rubber stoppers. Interestingly enough, this cold water coffee concentrate brewer uses a unique, wool-made filter. In the package, we also find a coffee bowl, filter pad, coffee bowl, measuring cup, rubber stopper, ground guard, decanter, and 2 sample paper filters for good measure. For a cold-brew coffeemaker with a larger capacity, the Primula Ep Carafe System definitely sands out for all the right reasons. Besides the generous brewing capacity, this model boasts a shock-resistant premium borosilicate glass-made carafe that helps preserve the coffee freshness, while an anti-slip rubber base offers stability for safe brewing experience. The product parts are entirely BPA-free, and because of the removable steel mesh and bottom, you are guaranteed a fairly easy cleaning process every single time. For brewing your choice coffee in its fine concentrate, this cold brew model from OXO is something to count on. We say this because you can use it for infusing tea as well as making coffee, a versatility not many such coffee makers have. Its carafe is made from high-quality glass and integrates a well-sealed silicone top, which recommends it for on-the-go user. The 32-ounce coffeemaker features a built-in metal mesh filter and also comes with paper filters. Also included is a water measuring cup for precision brewing. The Mason Jar cold-brew coffeemaker by Simple Life Cycle is designed to work with most jars found at home—either a quart-sized or half-gallon one. You can thus brew up much coffee; it all depends on the Mason jars in your kitchen. This system’s lid features an eco-friendly bamboo build, and along are easy-to-clean, reusable mesh filters included. With this cold brew system, you can store your magical brew refrigerated for up to 14 days with no issues whatsoever. You simply cannot go wrong with this cold-brew coffeemaker from Coffee Panda when it comes to reliability and maintenance. Its durable carafe, made of heavy-duty and dishwasher safe glass, optimizes coffee brew freshness by keeping the temperature well-balanced. With a 44 oz. capacity, it brews more coffee than regular coffee makers, yet its compact design fits in most fridge doors conveniently. Moreover, this coffeemaker’s non-slip, BPA-free silicon base ensures a great stability, safe use, together with the well-designed easy-grip handle and smooth and mess-free pour-spout. Thanks to its removable mesh filter, you are guaranteed an easy cleaning, while a tight, reliable lid keeps your coffee fresh at all times. The Ovalware’s Airtight is another reliable cold brew coffeemaker that doubles as a tea infuser. Offering a 34 oz. capacity, it allows you to refrigerate your greatly brewed coffee/tea. At the same time, the flask features a quality glass build to help you through when preparing more complex brews. It also comes with durable stainless steel filters that are guaranteed to last a lot longer than paper ones. We should also point out that Ovalware’s coffeemaker provides up to 4 cup servings per batch. While its airtight seal ensures zero spillage, you are guaranteed to clean its dishwasher-safe decanter and filter. A few, if any, models can beat the Toddy’s T2N Cold-Brew coffeemaker when it comes to ergonomy and ease of use. A cold-brewing pioneer model, it is designed to make the cold coffee brewing process even simpler by making its handling much more comfortable. The complete system is made of quality plastic and includes a functional, reusable filter. Quite pretty design-wise, the decanter is both durable and easy to clean. Interestingly enough, Toddy’s Cold Brew Coffee System can also be used for infusing tea, cold or hot. Not only that but the package includes 2 reusable filters, a rubber stopper, a decanter, and a useful recipe guide. Those of you who need to savor their iced coffee on the go can now employ a coffee maker like this exquisite coffee maker from Takeya. Despite its portable design, it offers a 1-quart brewing capacity which makes it ideal for 4 servings per batch. Furthermore, its lid is airtight, leak-proof, ensuring no spillage short and long-term. It also has to be said that its containers are made of dishwasher-safe, BPA-free plastic. 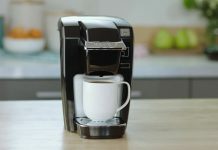 With this coffee maker, you can brew your choice coffee overnight, or even put it in the refrigerator for up to 36 hours to allow the grounds to steep. In terms of practicality, let us point out that it features an anti-slip silicone handle and an included mesh filter to makes easy work of all brewing tasks. Considered one of the most popular models available today, the Hario Mizudashi is a 1,000ml cold brew coffee pot that makes slightly over 4 cups of coffee per batch. Also featuring an easy-pour spout, this coffee maker includes a quality, reusable filter for good measure. Both the pot and the filter are simple to clean, and the coffee pot is dishwasher safe. Not only that but the spout and an integrated handle make using the coffee maker a much simpler, safer experience overall. All things considered, this might just be one of the most practical yet versatile cold brew coffee makers money can buy. Before settling on a purchase, you are advised to take the time and learn about the intricate nature of cold brew coffee makers and how appearances can sometimes misdirect you in more ways than one. We say this because even though you want these coffee makers to be practical above all else, you also want them to be versatile and easy to use. Some people don’t fully realize that the more complex a coffee maker, the easier you can operate them, which sounds quite counter-intuitive simplicity-wise. Before we get there, however, let us first find out what exactly we need to consider when buying a cold brew coffee maker. Refrigerator Size – Perhaps the first thing to consider when buying such an appliance is whether it fits your fridge properly. Seeing how fridges can differ quite a lot from one another when it comes to the size of their shelves and compartments, you should definitely measure the inside of your refrigerator to know exactly how much available space you have at your disposal. Not to say that cold brew coffee makers are bulkier or too large by any means, although they can definitely fit some fridges a bit awkwardly. Construction – On a related note, one should always pay attention to the construction type, design, and materials a coffee maker features. The reason we say this because flimsy materials may indeed make the coffee maker more affordable but they will also render it unreliable long-term. Instead, you should always look for coffee makers made of glass and ceramic as they are not only easier to clean but also prettier to look at. yet they tend to leave a metallic aftertaste behind. Ease Of Use – It is very important to invest in a coffee maker that you can use time and time again without any risks of it losing its efficiency long-term. You also have to look for a coffee maker that is just as easy to use as it is to clean, which is where high-end models tend to stand out despite their price tag. Not only that but you also have to look for a coffee maker that you can clean with relative ease, preferably one with dishwasher-safe components. Coffee Grounds – Another thing to consider when buying a coffee maker of any kind is the quality of the coffee grounds you plan on using it with. When it comes to cold coffee brews, you should focus more on coarse or highly coarse coffee grounds as they can be brewed into very flavorful batches. With fine grounds, on the other hand, you are forced to wait a lot longer before the batch is done because of how slow the drip will be. Price Tag – While it may not apply to other appliances, price really does reflect the quality you can expect from most coffee makers. This is because big brands make much sturdier coffee makers, and for that, they employ expensive components. 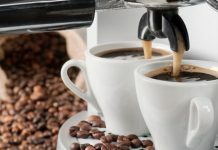 If you are a passionate coffee drinker, you should consider this as a long-term investment in the future, because otherwise you are bound to run into issues like a poor drip, a weak flavor, or difficulties when storing it. Type Of Coffee – When it comes to making cold brew coffee, you should lean towards African coffee due to their delicious fruity flavor. If, however, you want a more mellow taste, than you should go for Latin-American coffees instead. 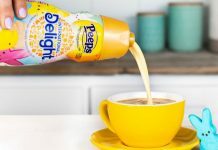 Keep in mind that you can sweeten the coffee at any point or even add extra flavors to it, unlike regular brews that require you to use a more rigid recipe. If you want, you can also combine two types of coffee for a more exquisite brew. Storage – With cold brews, most people expect the coffee to retain its flavor and aroma for long periods of time. In this respect, you can expect cold brews to last for a very long time if you refrigerate it, retaining most of its flavor in the process. Bear in mind, however, that the temperature of your refrigerator has to be constant at all times, lest you risk to spoil your entire batch or at least to lose some of the flavors. Steeping – Last but not least, keep in mind that cold brews have to steep for about 16 hours on average. In truth, anywhere between 14 and 18 hours should do the trick, just as long as you prepared it properly. The reason why cold brews require such long steeping is that the process allows water and coffee to reach a certain balance, a process that takes at least 14 hours for optimal results. Do try, however, to not go over the 18-hour limit as you lose spoiling your entire batch.